Pools up to 50,000 Gal. Chlorine ratings based on a pump run time of 8 Hrs. Competitors chlorine ratings are based on a pump run time of 24 Hrs. Do you have a model that would suit a 63,000 gallon pool. What would be the package cost? A Answered on 7/20/2016 by InyoPools Product Specialist Lennox H.
Hi Garnet, AutoPilot makes a multi cell system for larger residential and or commercial size pool which would be the AutoPilot Pool Pilot Professional Salt System. 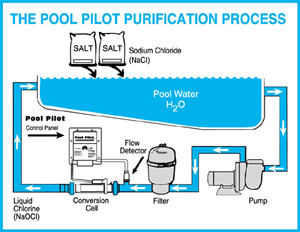 Is the salt included with the salt chlorine generator? A Answered on 2/29/2012 by InyoPools Product Specialist Patrick P.
No, salt is not included. You would purchase the salt locally and the quantity will depend upon the number of gallons of water in your pool. Use a salt that is at least 99.8% pure NaCl. The preferred salt is evaporated, granulated, food quality, and NON-iodized. Avoid using salt with anti-caking agents like sodium ferrocyanide, also known as yellow YPS (prussiate of soda). These cause some discoloration of fittings and pool surface finishes. DO NOT use calcium chloride. I have a pool that is about 10,000 gallons but I am thinking of buying a salt chlorine system for pools up to 20,000 gallons. Would the larger unit be a problem? A Answered on 2/1/2012 by InyoPools Product Specialist Patrick P.
It is not a problem to oversize a salt system. It would take the larger unit less time to produce the necessary chlorine so it is actually more efficient. When the pool volume is very close to the capacity of the salt chlorine generator (for example, the pool is 18,000 gallons and the generator is rated at a maximum of 20,000 gallons), we would recommend going up to the next size generator. 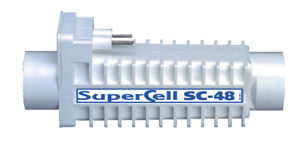 What is the warranty on the Salt Cell itself and the Power Supply? A Answered on 5/17/2007 by InyoPools Product Specialist Patrick P.
The power supply has a 2 year parts and labor warranty. During the 3rd year, 50% of parts cost is covered. The cell has a 2 year full parts and labor warranty. During the 3rd year, parts are covered at 50%. During the 4th year on the SC48 and SC60 ONLY, 25% of parts are covered. During the 5th year on the SC60 ONLY, 15% of parts are covered. Does this unit include the bypass manifold, chlorine cell and the power supply. A Answered on 6/4/2006 by InyoPools Product Specialist Patrick P.
Yes this unit does include the bypass manifold, chlorine cell and the power supply.